Are Virtual Reality Live Events the Next Big Thing in Social Media? Home » Blog » Tech Trends » Are VRlive Events Becoming a Thing? AltspaceVR wants to enable people to attend live events in virtual reality. With mounting competition from platforms like Sansar and High Fidelity (both of which are in Beta at the moment but planning public releases for 2017), it seems like AltspaceVR’s strategy is increasingly focusing on live events as their unique selling proposition in the Social VR Space. 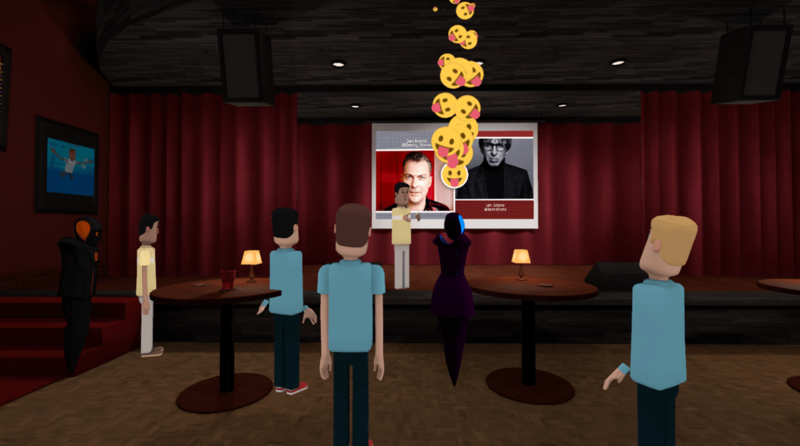 AltspaceVR held the first UK live comedy show in virtual reality, which marks a significant strategic move for the company as it tries to prove the case for enabling people to attend live events in virtual reality. But why hold such a milestone event in London if the company is still firmly based in Redwood City, CA? It’s actually part of their broader European expansion plan, explains Head of International Market Development Debby Shepard, who has just relocated from San Francisco to London to spearhead that. With around 30 percent of their current base made up of European users, AltspaceVR hopes to significantly grow that by providing greater support and expanded programming. That strategy of building on geographical clusters makes sense in the context of trying to grow a social-based product, since we’re much more likely to engage with those sort of experiences if our friends are already on board. The live show featured two very well-known names in the vibrant comedy circuit, Ian Stone (ranked among the top ten stand-ups in Britain by The Independent and a member of the Comedy Store’s ‘Cutting Edge’ team) and Ben Norris (who apart from being the cousin of actor Martin Freeman, is a regular on popular UK television shows such as Mock the Week and Never Mind the Buzzcocks). I was told that attendance for such events ranges/has ranged up into the thousands, and an encore presentation should be available on Dec. 26 at 7 pm Pacific here. AltspaceVR’s live event capture technology launched in November and can capture live events in full VR, so users can either watch a performance live or an encore after the event (or both). Previously they had tested some of this functionality in a partnership with SyFy for their show Halcyon, where they showed the first episode in VR and hosted a virtual reality international press junket on the platform. The benefits of that for a global audience are clear, as it transcends the need (and associated cost) of travel and lets them do so at a convenient time for them while keeping the social and interactive aspects you don’t get with simply watching a recorded show on TV. This FrontRow technology means that only a fraction of the attendees are visible in these images, explains Gerald Gottheil from AltspaceVR’s marketing team. The idea, presumably, is that no matter how many people sign up to participate in an event, you never get your view blocked by that annoying tall, hat-wearing person standing right in front of you. Although the potential of using VR’s immersiveness to make live experiences available to larger audiences is certainly clear, it’s also quite obvious that it’s still very early days for this technology. For one, the AltspaceVR avatars still have that characteristic cartoon woodiness that have been a staple of such platforms since the ’90s. That, however, might soon be set to change, especially if they manage to plug into some of the bolder advances in personalized-avatar technology we’ve seen emerging in the space recently. Another interesting aspect of this announcement was the way it overlapped the real and virtual worlds by offering audiences based in London the chance to gather in a physical space to watch a virtual reality performance together with their friends at Camden Square’s recently opened Virtually Reality space. This represents a new concept that not only plugs into London’s thriving VR start-up community to help bring their products to market, but also provides ordinary consumers with a physical and social space which invites them to experience and learn about VR and discover its possibilities through hands-on play. Touting themselves as the “UK’s first virtual reality retail and experience space,” they started out as a stall on Portobello Road selling mobile VR headsets, and managed to capture the imagination of enough passers-by to fund their next move into its current trendy Camden base. It will be really interesting to see how many more such spaces start cropping up in major cities in 2017 as VR takes off.